HMD Global announced Nokia 3.1, successor of last year’s Nokia 3 back in May. The device came with Android 8.0 (Oreo) baked into a 5.2-inch HD+ display, along with MT6750 octa-core processor. At the launch HMD Global promised to update the device said that the to Android 9.0 (Pie). Now, in effort to the fulfillment of that promise, the company has released Android 8.1 (Oreo) for the Nokia 3.1, a confirmation that sooner or later, Android Pie will follow. 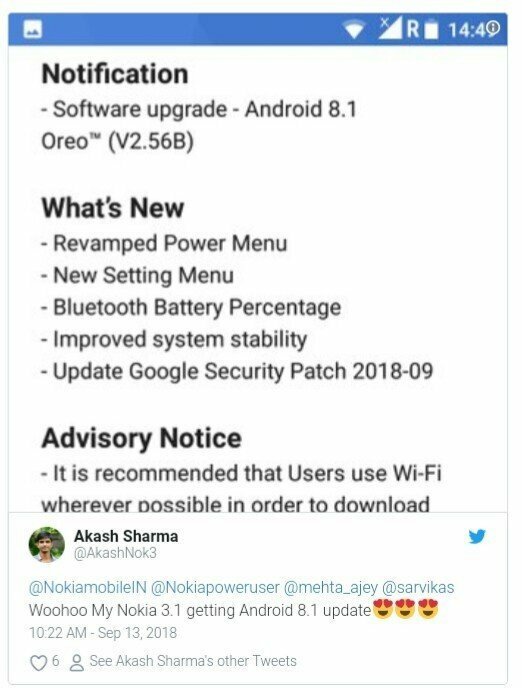 Nokia 3.1 v2.56B Android 8.1 (Oreo) update is 1.12GB in size and also includes Android security patch for September, 2018.WOnly ith the Android 8.1 owners of Nokia 3.1 will enjoy features such as Neural Networks API, hamburger emoji fix, Revamped power menu, New Settings Menu, Bluetooth Battery percentage and developer APIs (API level 27), along with the latest optimizations, bug fixes, and security patches.